Fans of the impressive Ford Ka can look forward to two new Zetec editions – the Ford Ka White and the Ford Ka Black coming to showrooms soon. The cars will come in either Crystal White or Midnight Black paint schemes with black allow wheels and seats that have a unique Pearl White detail. This white stitching will also extend to the handbrake, gear shift gaiter, floor mats and leather dressed steering wheel. 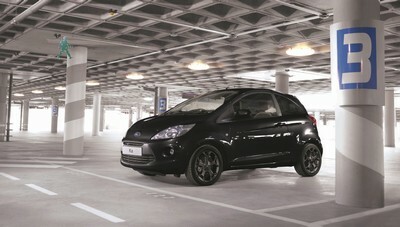 The popular city car will also have, Ford says, ‘sophisticated and personalised’ interiors. The firm has opted for the colours because they represent trends in technology and clothing for uncomplicated and pure styling. Opt for the Ford Ka Titanium and the car comes with a comprehensive list of equipment enhancements to create what must be the most luxurious Ka ever made. Among the new standard equipment includes heated front seats with leather trim, rear parking sensors, panoramic roof and side and curtain airbags. There’s also new 16 inch alloy wheels and a black painted grille. Options include the fitting of a body-coloured roof spoiler. The Ford Ka Black and White editions come fitted with the firm’s 1.2 litre Duratech petrol unit which should return around 58 mpg while having CO2 emissions of 115g/km. Meanwhile, Ford is also announcing some updates on its bestselling Fiesta range with its excellent 1.0 litre eco-boost engine now available in the standard Zetec S line-up. In addition, the Ford Fiesta Style range now comes with more standard kit including DAB radio and LED daytime running lights as well as two new colour schemes to choose from. Options for the Ford Fiesta include the firm’s voice controlled connectivity system, Ford SYNC, which has its ‘emergency assistance’ which will see the car contact emergency services in an accident situation, for instance. There’s a range of improved engines with the best of them being the 1.5 litre TDCi diesel unit returning around 80 mpg while having CO2 emissions of 82g/km. Ford is also making some adjustments to the engines available for its popular B-Max range. Buyers can now opt for the low emission Euro6 diesel units which have start/stop technology to help boost fuel economy. This entry was posted in Car Leasing, Cars, Popular Cars, Small Car and tagged Ford Ka, lease a new Ford Ka by Steve Lumley. Bookmark the permalink.